Best Linear Unbiased Predictor - computer software used to estimate progeny performance, which uses full pedigree records and links progeny performance across years through common link sires. A statement of the traits (production characteristics) that a breeder wants to improve, and the emphasis to be given to each one. Comfort factor is the percentage of fibres in a Fibre Diameter Distribution which are finer than 30 microns. Clean fleece weight, after the greasy wool is scoured. 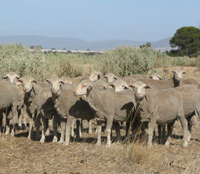 Central Test Sire Evaluations, there are 14 sites across Australia where single rams are mated to a random selection of ewes that are run as a single group. The progeny are measured giving comparisons between rams. The use of link sires allows comparisons between sites to be made. Coefficient of variation - a statistical measure of the variability exhibited within a set of values. It expresses the standard deviation as a percentage of the mean; the higher the CV, the greater the variability. Is the best estimate of a ram’s value as a parent compared with all the other rams in a tested group. It is the best estimate of how well a ram will ‘breed’ for a particular trait. The average of each measured trait from the tested group is zero. The EBVs are calculated for each trait using the breeding objective values. The units are expressed in actual units, i.e. micron, Kgs, % or newtons/Ktex. Fibre diameter or micron of the wool fibres. Fibre diameter coefficient of variation. Faecal egg count, the degree of resistance to intestinal worm larval. Hogget body weight, 15-18 months old. Combines all the tested traits into a single figure, according to the breeding objective of a ram breeder. A different selection index will have a different value for the same animal, as the weighting for each trait changes in the selection index. 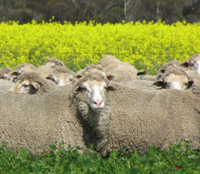 Individual sheep can be compared only with other sheep that have run together under the same nutritional and management conditions. Where some of the whole drop have been classed or otherwise split and managed differently, those different subsections must be measured as distinct groups. 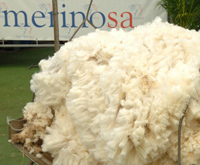 The wool trade pays a premium for each micron decrease and the premium varies across years. The range of premiums over a 5-10 year rolling average is 3%, 8% or 12%. NLW Number of lambs weaned per ewe each year. The change in profit associated with one unit change in that trait during an animal’s lifetime, assuming the value for all other traits doesn’t change. An objective statement about where you want your flock to be in 10 years time, i.e. lower micron by 1 micron while increasing clean fleece weight by 350g and maintaining bodyweight; to increase staple strength by 2 N/KTex and increase resistance to intestinal worm larval by 30%. Each trait must be heritable, definable and have an economic value. For accurate sampling it is essential to use the same location on every sheep to be measured, either mid-side or pin bone. Standard Deviation is a statistical measure of the dispersion of individual results. Staple strength, expressed in Newtons per Kilo Tex.